Is Neo set to return to the Matrix in 3D? The lovely Geoff Wakeling highlighted to me that there was a rumour going around that there are another two Matrix films on the cards. At first I wasn’t so sure if I wanted to see Neo return to the Matrix. I am a huge fan, I even wrote my dissertation at university on the trilogy but surely revisiting a film that arguably changed sci-fi over a decade ago when it has already had two sequels is not going to produce anything good? Well it seems that even if I’m sitting on the fence on this one two further sequels appear to be on the cards. Keanu Reeves has announced that whilst the Wachowski brothers were round his house for Christmas they highlighted that they have been working on two scripts and they want to shoot the films in 3D. Keanu has announced that he’s game so stay tuned for more information soon! 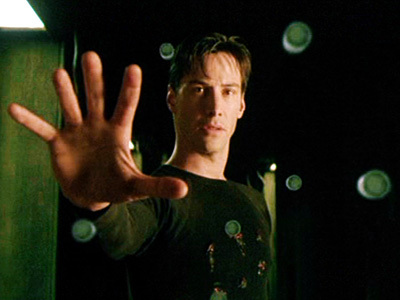 Also, I stumbled upon this image which seems to be linked to the phrase Matrix 4, is this how we will see Neo in 3D? Thank you for the lovely mention! If they were ever going to do more Matrix I’m glad they left it a few years. The last one, in my opinion, was ghastly and far from the ground breaking epic of the first. Now a few years have passed I hope that the brothers (not even going to try and spell it) have come up with a compelling idea along with new, groundbreaking, graphic appeal.